Our trip to Palm Springs coincided with Modernism Week, which presented an amazing opportunity to check out some of Palm Springs’ famous midcentury modern homes. We stopped into the Modernism Week Camp to check out their amazing pop-up shop and displays, and inquired with the information desk about architectural tours. There are organized bus tours during Modernism Week, but we decided to venture out on our own. The Camp gave us a bike tour map of North and South Palm Springs. 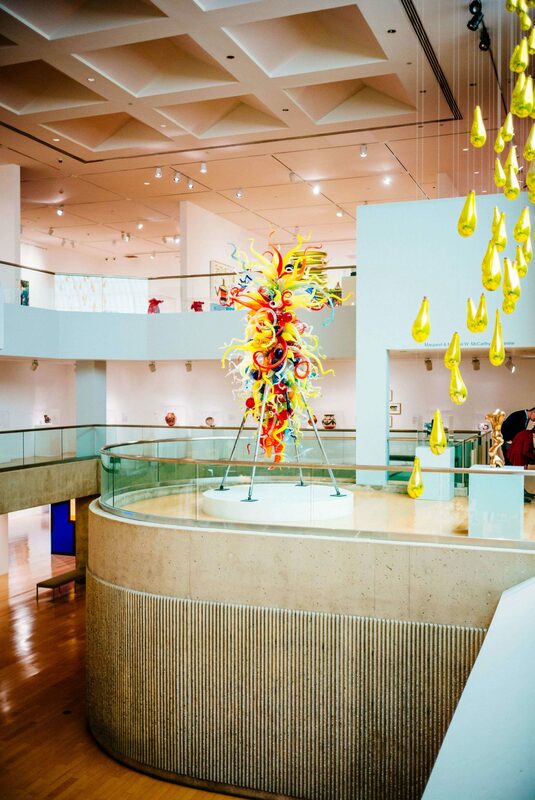 After walking through the world-class Palm Springs Art Museum, we headed out from the Camp on our tour through North Palm Springs. One of our first stops (not on the map) was this amazing house for sale on Crescent Avenue. We loved the blue color theme and the wall out front. It’s amazing how fast the neighborhood changes once you walk a few blocks from Downtown. Just a few blocks west of Palm Canyon Drive, the busy strip gives way to manicured lawns and towering Palm Trees. The foothills of Mt. San Jacinto serve as a stunning backdrop. 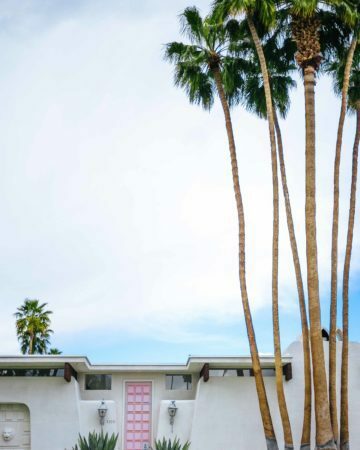 We couldn’t believe how incredibly well-maintained these historic homes are, and how well the desert landscaping accentuates the clean, modern lines of the homes. The Bougainvilleas in this neighborhood are total showstoppers, with hot pink blossoms creeping up pristine white walls and accenting bright pink, turquoise, and yellow doors. 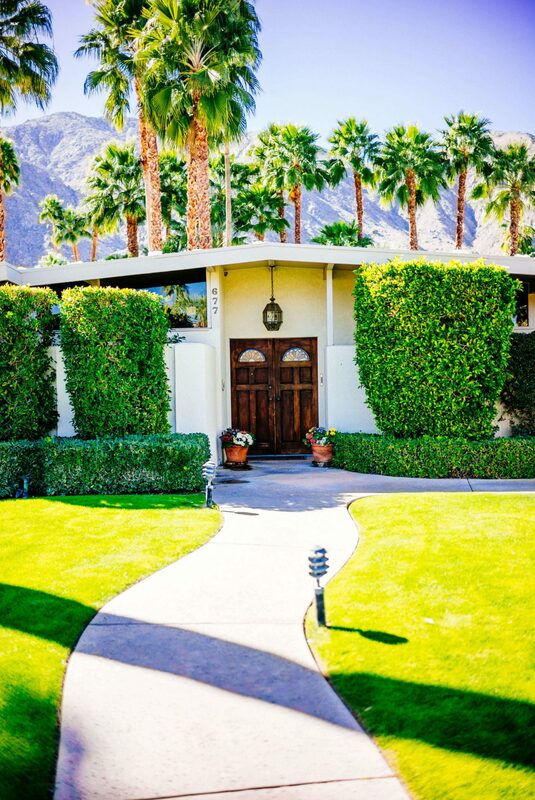 If you do some research before you head out to explore Palm Springs’ residential neighborhoods, you can locate the homes of some of the most famous Hollywood stars. 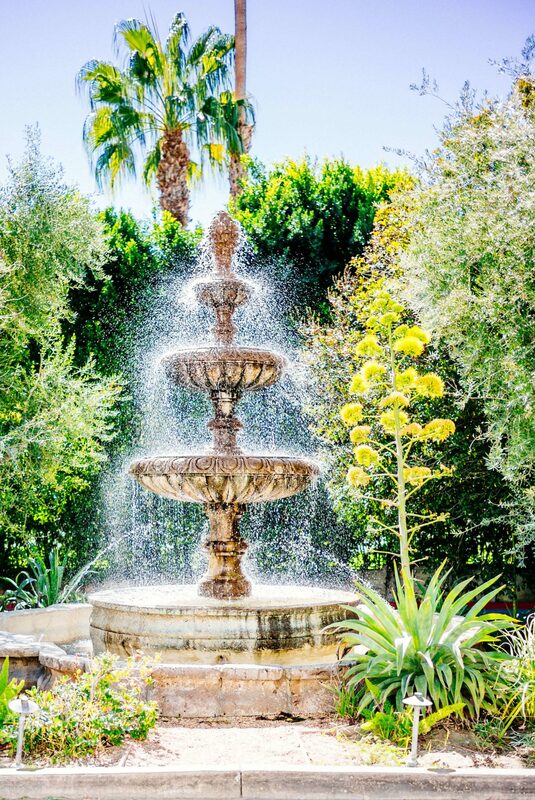 Palm Springs is home to estates previously owned by Frank Sinatra (1145 E Vía Colusa), Dean Martin (1123 N Via Monte Vista), and Cary Grant (now Copley’s restaurant). If you are planning a trip to Palm Springs, definitely set aside a few hours to admire some of its incredible architecture by bike or on foot. It’s a great way to burn off some calories from your margaritas and get some design inspiration at the same time!